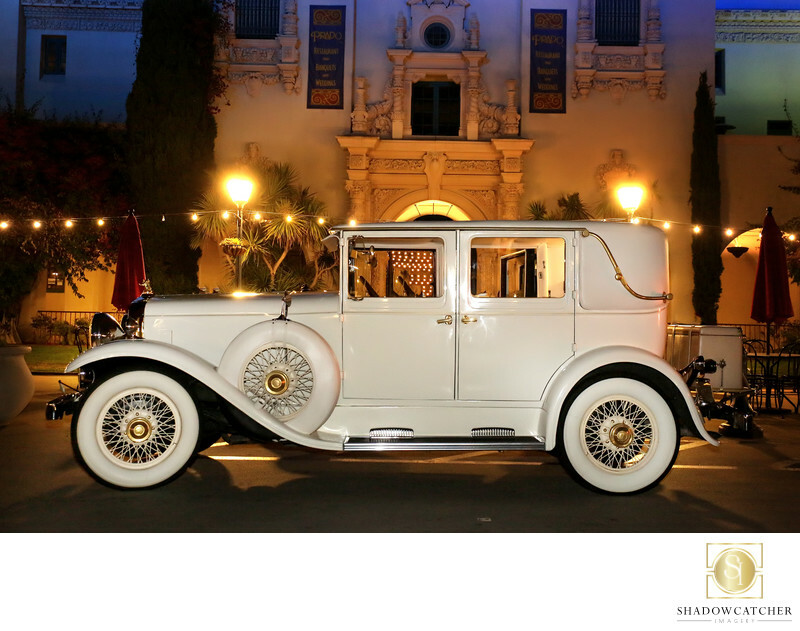 The perfect way to make an entrance or exit from your Luxury San Diego Wedding, a Vintage car! Our Couple was married at The Prado in Balboa Park and had a wedding filled with beautiful high end touches. As photographers in San Diego, these are the weddings we dream of, making timeless memories all day long! This is a 1929 Franklin, beautifully restored, but given a modern drivetrain. The interior is as nice as the exterior, too. The gold trim against the ivory paint gives it an eye catching elegance. The Prado Building behind the car gives the perfect vintage background, looking like a moment in time from the past. My flash balanced perfectly with the lights on the building and the old street lights. Keywords: Balboa Park Wedding (21), high end wedding (15), wedding coordinator (3), Wedding Photographer (24), wedding transportation (3).